Jaggery is a sugar rich product of sugarcane juice, dates or palm sap. Unlike common sugar, it is not a very refined product and contains impurities including molasses, wood ash, bagasse fibers etc. As compared to plain sugar and glucose solutions which are absorbed instantly and lead to instant rise in blood glucose levels, jaggery has a slower release of energy thus can provide energy for a longer time. Also, the slower action of jaggery reduces the potential risk of quick rise in glucose levels particularly in diabetics. Jaggery can be used as a sweetening agent in a variety of cuisines. While other sweeteners are just sweeteners, the additional things in the jaggery provide it a different taste besides supplying minerals and other nutrients. Jaggery comes in different flavors depending on the source like sugarcane jaggery, date palm jaggery or palmyra jiggery. Now, it is quite known that having desserts at the end of meals not only finishes your meal on a sweeter note but also facilitates digestion. Jaggery, especially in India, has been recommended to be eaten after a meal. It activates the enzymes for a quicker digestion. Moreover, it itself get converted to acetic acid which again speeds up the digestion in stomach. Jaggery is a good source of minerals owing to its unrefined form. It retains most of the minerals present in the sugar cane, while additional iron might be attained while it is processed in containers made of iron. 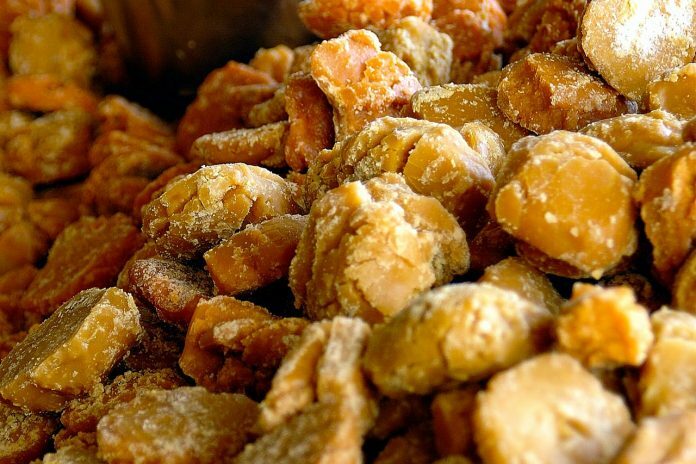 Jaggery is known to clean various body parts including respiratory system, esophagus, stomach and intestines. It removes various unwanted products and dust particles from the body. The presence of fiber in jaggery also improves bowel function thus further aiding in removal of waste and toxins from the body. Jaggery is sometimes used in lining the earthen ovens. This practice seasons the food cooked inside the oven, imparting it a different flavor. Apart from its use in food and cooking jaggery also has other uses like adding in cattle food, fish bait, hunting bait, taken with tobacco by addicts and for various religious customs in some Indian villages.